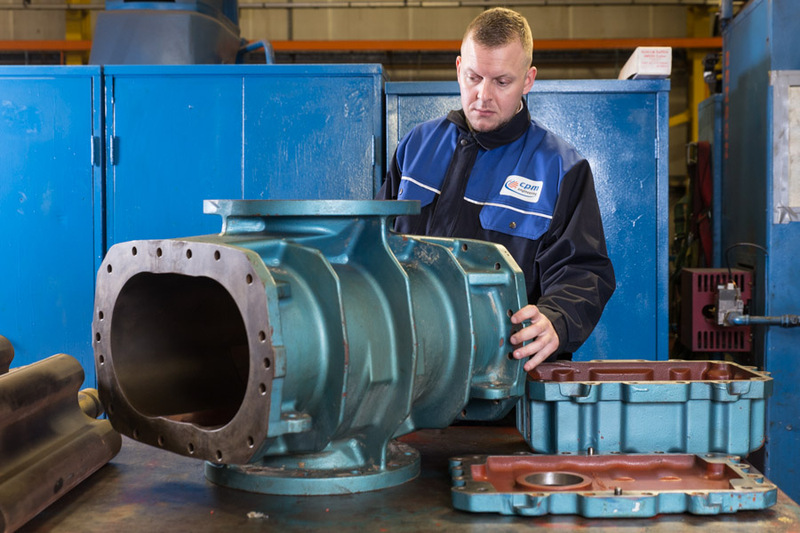 Maintaining Positive Displacement Blowers is critical if production is not to be affected and very expensive repairs are to be avoided. This type of blower is used extensively in industry for the delivery of bulk materials in such diverse industries such as food and beverage, chemical, pulp and paper, minerals, life sciences and environmental. The machine operates with a motor driving dual eccentric impellors usually via a pulley and belt transmission system. The dual impellors counter rotates within a cast iron casing. The air within the casing fed through an inlet is trapped between the impellors and the casing. With each revolution the air (or gas) is forced out of the discharge against whatever pressure exists in the system. With this type of machine the clearances within between the rotors and the casing parts is important if the efficiency of the blower is to be maintained. These parts are machined to very close tolerances which have to be maintained. But with the application often calling for 24 hours a day operation the gradual wear of the rotating parts has to be taken into account. 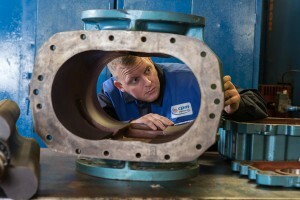 CPM’s experience suggests that a regular maintenance programme will add years to the life of the machine in addition to minimising unplanned downtime. In addition to the regular daily and weekly tasks such as checking belt tensions, oil levels, monitoring vibration frequencies, cleaning filters, checking relief valves and leaks etc. the wear should also be measured and considered. Having studied the wear patterns of the rotating components and seen some of the catastrophic results of failures CPM would always advise that these types of machines are removed from service periodically and a full overhaul performed which would normally include sending it to an experienced service centre. The blower would be disassembled and the components closely examined and the wear measured, the bearings and seals would be replaced as part of the OEM’s parts kit but only after the seating’s and housing have been measured for size and ovality. Setting the gear end assembly is important during the reassembly stage with particular attention being made to the O Rings, dowels, shims, drive assembly, retainer rings, lubrication and fasteners. 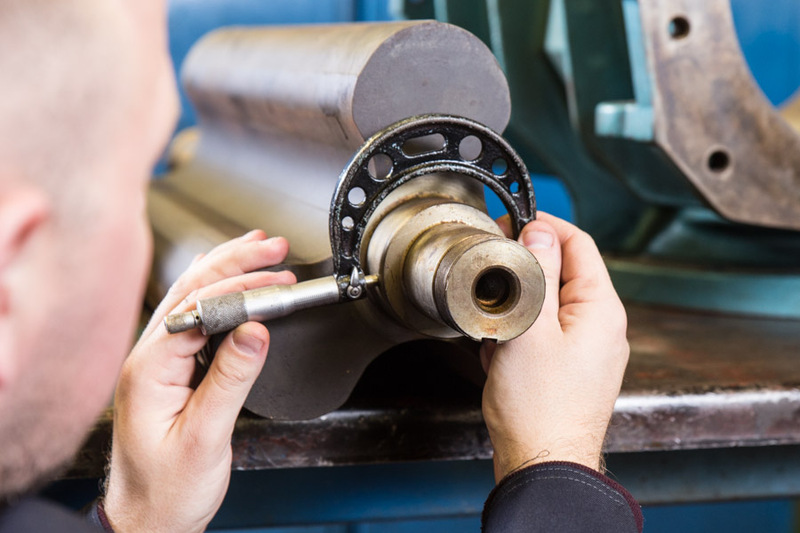 Once the assembly process is complete the machine should be tested under precise test bed conditions for a set period and the test data recorded which will then form the baseline measurements for when the machine is reinstalled back into production. If the machine is not being reinstalled following overhaul but is going into long term storage there is a ‘good practice guide’ to follow to ensure that the blower is not affected adversely from the storage. This includes protecting the eccentric rotors, rust prevention applications, sealing the inlet and outlet vent openings, store in a temperature controlled and vibration free environment and rotate the rotors by hand at least monthly. CPM offer a site based inspection, maintenance, and service centre overhaul and storage service to its customers to maintain the efficient operation of these machines. They can also advise on mainatence and service intervals. For more information call +44 161 865 6161.